The Nugsmasher product line-up are all Plug-N-Play presses. Simply plug into your power supply and turn unit on and you are ready to start extracting! The Nugsmasher Pro version has a built in pneumatic function as well. The Nugsmasher is a well-equipped machine requiring multiple power circuits to make everything run properly. With safety in mind, our electrical engineers have routed each of the 3 sub-circuits as well as the primary power circuit through high quality, resettable circuit breakers which are neatly mounted to the front panel for easy monitoring and access to reset them if needed. The Nugsmasher product line-up offers precise temperature control of the heat plates. Just set your desired temperature and the controllers will bring the plates to temp and keep them consistent throughout your pressing session. Increase your chances of having repeatable results by ensuring you are pressing the same each time you load your press. The built-in gauge allows you to find the perfect amount of pressure for your material and apply the same amount on your next press with ease. *Gauge only available on Nugsmasher Pro and Nugsmasher XP. The top plates of the Nugsmasher line-up are thermally isolated. This design minimizes undesired heat transfer away from your pressing area. This helps maintain efficiency as well as maintaining your desired temps on the plates. Both the Nugsmasher PRO and Nugsmasher XP features 2 LED's lights focused on the pressing area and have this built in option standard. Solid interlocked USA structural steel creates the frame of the Nugsmasher product line-up offering well beyond the individual pressing abilities. Aircraft grade aluminum is fully CNC machined in-house and is used for the pressing plates. No other press offers the flexibility in pressing preference found with the Nugsmasher line-up. Our customers have spoken and we’ve listened! Providing the proper machine and accessory for the master extractor’s every need. 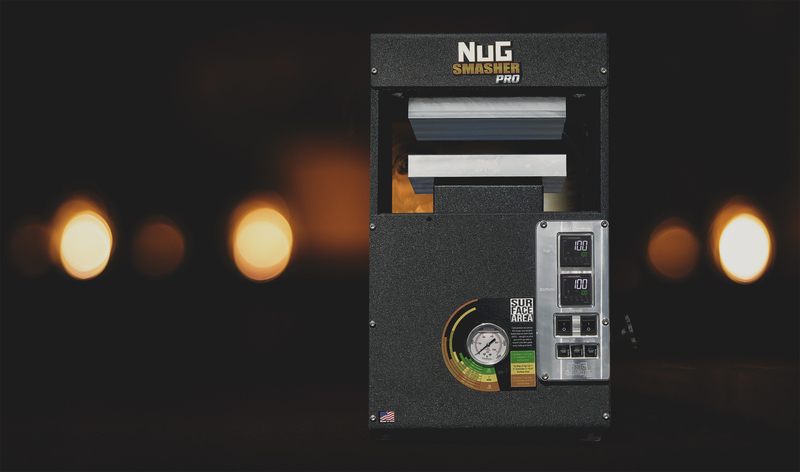 The Nugsmasher product line-up is equipped with specific purpose designed heat cartridges on each of the top and bottom plates allowing for a quick start-up, more even heat disbursement, and better maintained target temps throughout your pressing session. Subscribe to get special offers, free giveaways, newsletters, and once-in-a-lifetime deals. These statements have not been evaluated by the FDA and are not intended to diagnose, treat, or cure any disease. Which Machine/Machines Are You Interested In? Which Machine/Machines Do You Need Assistance With? Now is a perfect time to start planning for that perfect gift! Take advantage of the Nugsmasher Layaway Plan with deposits as low as 20%! No interest, no service charges. Payments must be made in full within a 6 month period prior to shipping products. Loyalty upgrade program, trade up your current Nugsmasher machine for an even better unit. Original purchasing customer may upgrade to a higher priced unit. Customer obligated to pay the difference in currently listed prices plus a 20% restocking fee from the lowest current price. The customer is responsible for returning the original unit at their own expense as well as any applicable taxes. Take advantage of great financing options available with Paypal Credit. Select Paypal credit at checkout for details.